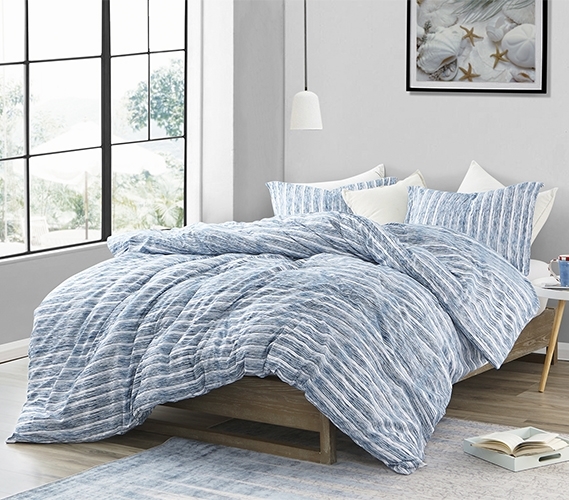 Blue Striped Twin XL bedding will add to your college decor! Looking for Aura Blue Comforter in size Queen or King? DormCo's line of designer Twin XL comforters are the perfect addition to any dorm room, as they will add unique style on top of the essential comfort that your college bedding needs. Our stylish Aura Blue - Twin XL Comforter - Supersoft Microfiber Bedding has a great look and soft touch that will give your dorm bed the comfort and style it needs. Complete with a Twin XL comforter and a matching standard size college pillow sham, this dorm bedding set will easily cover your extra long Twin bed with what it needs to have an impact on your college decor. The cohesive look of this college comforter set features a one of a kind blue striped design over a white backdrop. 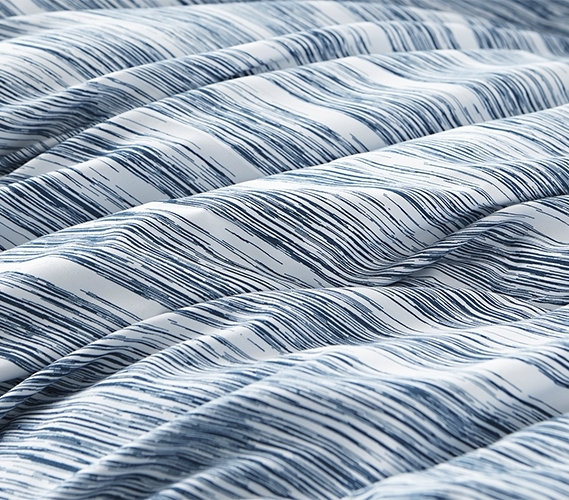 The unique pattern that spreads across this blue and white Twin XL comforter will give it a modern appearance that is great for today's college dorm rooms. And even though the style of your dorm bedding is great, we can't forget about the essential comfort of such an important college item. Luckily, this designer Twin extra long comforter set is made with cozy college bedding materials to keep you warm and cozy on your dorm bed. A thicker than average polyester fill is surrounded by comfy microfiber material that will give you highly cozy and soft Twin XL bedding. This combination of such cozy college bedding materials will ensure that you feel perfectly comfy on your dorm bed.